In the kidney, the connecting tubule (CNT, or junctional tubule, or arcuate renal tubule) is a tubular segment of the renal collecting duct system that connects the distal convoluted tubule to the cortical collecting duct. Many sources include the connecting tubule as part of the collecting duct system. However, the embryological origin is more similar to the nephron than it is to the rest of the collecting duct (which derives from the ureteric bud), and other sources therefore classify the connecting tubule with the nephron. 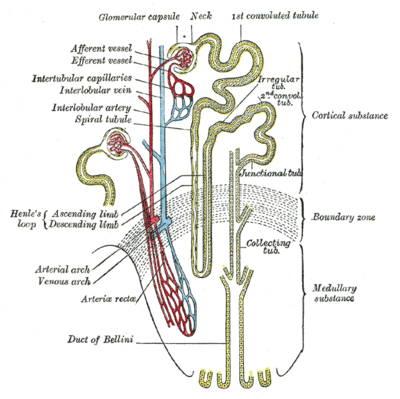 Some connecting tubules, usually associated with juxtamedullary nephrons, arch upwards before reaching the cortical collecting ducts. It is this "arcuate" feature which gives the tubule its alternate name. It participates in the regulation of water and electrolytes, including sodium, and chloride. The CNT is sensitive to both isoprotenerol (more so than the cortical collecting ducts) and antidiuretic hormone (less so than the cortical collecting ducts), the latter largely determining its function in water reabsorption. Eaton, Douglas C.; Pooler, John P. (2004). Vander's Renal Physiology (6th ed.). Lange Medical Books/McGraw-Hill. ISBN 0-07-135728-9. Imai M (1979). "The connecting tubule: a functional subdivision of the rabbit distal nephron segments". Kidney Int. 15 (4): 346–56. doi:10.1038/ki.1979.46. PMID 513494.